One of the more remarkable releases of 2014 was Josienne Clarke and Ben Walker’s Nothing Can Bring Back The Hour. Their Fire & Fortune debut of 2013 garnered all manner of award nominations from the folk community, yet with the new record, they seem to have shifted gear to produce apiece of work which is both enthralling yet also quite intriguing and thought provoking in its content. Bright Young Folk took the chance to delve a little deeper with the album’s creators. Given the album title is a Wordsworth quote, how did you find him an inspiration to your work? Josienne Clarke: I’m certainly no great expert on poetry but am quite fond of the Romantic poets and the album certainly has a sense of Romanticism running through it. The opening track ’Silverline’ is very much a condensed version of the themes and ideas contained in Wordsworth’s ’Intimations of Immortality’ the poem the album title is taken from. I very much identify with the inherent melancholy of times passing and Silverline was about wrestling with the notion that joy, though present and intense, was somehow always undermined by a feeling of sadness that it could not last forever. Ben Walker: I’m not really into poetry and I work mainly with the musical side of our songs, narrative is very much Josienne’s area of expertise but I think the ideas of Romanticism and particularly English Romanticism appear throughout the album. I was certainly taking inspiration from the pastoral soundscapes of Romanticism when approaching the orchestration. Could you see the albums lyrics reading like standalone poems? Josienne Clarke: "No" is the short answer to that. I think a good song doesn’t necessarily make a good poem, they aren’t really the same discipline. It is my personal belief that song lyrics should be composed simultaneously with the melody and that it’s the relationship of one to the other that makes good song-writing. How a line of text is placed upon a tune is the art of song-writing as I see it, you can add emphasis to certain words or phrases by setting them into a melody in a specific way. This is both a greater freedom and more of constraint than poetry. You can use the music to help you but then you are in some way restrained by the literary limitations of song form. However the lyrics are very central to this album and are the basis for all of the larger musical ideas. Perhaps more so than any other release of ours and I have certainly given them as much time and thought as I would to writing poetry. I do not write poetry by the way, I’m not any good at it! Do the songs ’Now You Know’ and ’Water To Wine’ offer some hope of redemption in an album which is quite melancholy lyrically? Josienne Clarke: I think there is a bit hope laced throughout the entire album actually, but I can see why it might not appear so! But perhaps these two songs particularly hint towards a positive on the horizon somewhere. ’Now You Know’ refers to Sturm Und Drang, (translated literally as ’Storm and Stress’ but ’Storm and Passion’ is more accurate) which was a Romantic Era movement started in German literature. It concentrated on individual emotional turmoil and the great uncertainties of the human condition and the music was characteristically grand and dramatic. This song is about a life-changing experience that is the making of you and could be interpreted positively or negatively. So it could be a trauma that changes the way you view the world. Or it could be falling in love or I imagine, the way having children might change your perception of everything perhaps. Ben Walker: Musically those two are quite different, ’Now You Know’ has this brooding climax which, again, harks back to Romanticism and I have attempted to musically reference the sense of Sturm Und Drang with a particular use of dynamics and tremolo in the string parts. Josienne Clarke: ’Water To Wine’- Is about the expectations our modern world increasingly puts upon us and those that we, in turn, put on ourselves. I think in the past peoples expectations were simpler, It seems to me that now, in our rampantly capitalist society and celebrity culture, we are no longer encouraged to feel content. Ben Walker: ’Water To Wine’ as the Epilogue rather than the last song is more of a quiet reflection. I certainly think of it as one of the more hopeful in mood musically, with the string work I was aiming for something to lift the middle section and compliment the otherwise jazz-influenced main arrangement. How did you choose the traditional songs to match with the theme of the album? Josienne Clarke: Most of my songs are first person narrative, and so I was looking for traditional songs with a similar tone lyrically, they had to have a female protagonist and be both reflective and melancholic. 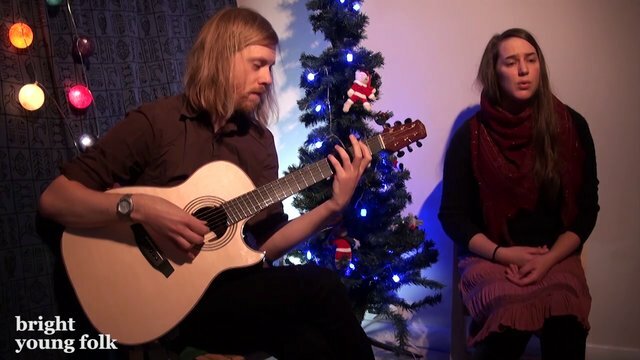 Ben Walker: We have a decent repertoire of traditional songs ’I Wonder What Is Keeping My True Love Tonight’ was a favourite of ours from June’s album ’Aleyn’ - we’d been playing it live with just the two of us and felt it fitted in nicely. "Let No Man..." we knew from Pentangle. John Renbourn is a big influence but we wanted to do something that hadn’t been done before with the arrangement. "The Queen of Hearts" we’d heard first from Joan Baez. The early renaissance sound we went for was something I’d wanted to explore, and the arrangement was sort of my version of an early music recorder consort. The album is very ambitious and has a particular feel to it that we’ve been struggling to define: stately, lush, timeless even. For those who haven’t heard it, how would you describe it and how did you go about capturing this feel? Josienne Clarke: We were aiming to create something beautiful and refined, something that combined the old with the new, reverent and nostalgic but also current and audacious. We were attempting to make something classic I guess. In terms of capturing that it wasn’t a case of “get in the studio, play some stuff, see how it sounds” though that’s a great way to create an album we were going for something far more conscious than that. We had demos of everything and a very clear idea about what we wanted the final product to come out like. As an album with a clear concept I knew that it all needed to tie together and that each arrangement of each song had to enhance the overall narrative. It’s one of the most painstaking projects we’ve ever done but we were working on the ’if something’s worth doing…..’ principle. Ben Walker: It was quite a conscious decision to try and push the boundaries a little. We didn’t want to just make another album of voice and guitar, and I think when you’re making a recording it should be an opportunity to realise some of your creative ideas more fully. As a guitarist, there are things I physically cannot play, counter-melodies that I’d need four hands for, and yet I can hear them playing: so the album was a great opportunity to bring those ideas to life for once. We recorded and produced everything ourselves, even down to recording the entire orchestra one part at a time from my home studio. Because of this, we were acutely aware of the sound as we were going along, and could change things almost on the fly. We also demoed everything well in advance. What was your experience putting together orchestral arrangements for songs? Ben Walker: Many hours in front of Sibelius! I’ve not been classically trained as such, certainly not in any way that I can describe what I’m doing, but I can read and write music. The whole process generally involved demoing the tracks and then sketching in ideas with fake strings. I play mandolin, which is tuned the same as a violin, so had a reasonable idea of what is and isn’t possible as far as stretches, scales and range goes: you can do the same trick with a mandola and viola. When working out the parts, I tend to hear phrases that should be played at certain points in a song, write them into Sibelius, and then spend the rest of the time working out what each instrument should be doing between each phrase. It’s probably the wrong way round officially but I haven’t studied orchestration so it’s just the way I work. Can you tell us a bit about the idea behind the artwork and photographs in the CD booklet? Josienne Clarke: I wanted something that visually expressed the idea of old and new together, it was intended to look nostalgic but also aware of it’s own time. I wanted a certain awkward quality to the juxtaposition, for us to look both elegant in one way and in another a little ridiculous and over-dressed. I went for that era of dress because it’s slightly rigid and classical, that gave the contrast between us, and the modern setting more emphasis. It was a brave choice to shoot the photos out and about in London dressed up, rather than in a more controlled environment. Did you have fun doing this? Josienne Clarke: Yes you’d think so, however in central London it didn’t attract anywhere near the attention we thought it would. To be honest no one batted an eyelid luckily but I guess we did leave ourselves open to the elements. Ben Walker: It was great fun, though not as difficult as you’d think: people barely noticed. London is weird, especially where we were around Covent Garden, for every person dressed in period costume, there’s another one going to work wearing a clown suit or something, there’s always someone doing something bizarre.